Designed to help alleviate the symptoms associated with conditions such as lymphedema, lipedema, and cellulite, our Bioflect® Infrared Therapy Micromassage Treatment pants are made from a proprietary FIR therapy fabric, with everlasting earth minerals woven into the DNA of the fabric. The fabric reflects the body's energy back to the body in the form of infrared, helping to boost slugglish circulation. Garments are woven with a 3D micromassaging ripple knit that further boosts circulation through diversified pressure points along the skin. 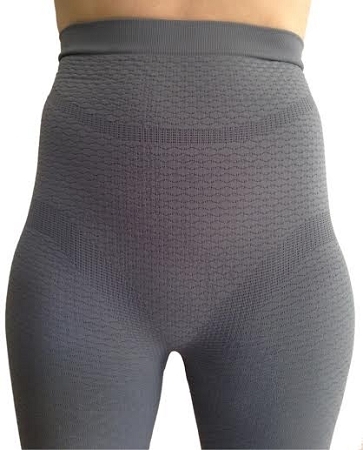 Our lymphedema lipedema compression garments are powered by a combination of advanced micromassage knitting, compression technology, and FIR therapy material that retains its healing benefits for the lifetime of the garment. Garments are useful for lymphedema and lipedema management. Ankle length treatment pants are high waisted in order to provide truncal support and full abdominal coverage. All Bioflect garments are bacteriostatic, keeping odors under control. Copyright © 2014 Biolfect Medical Group. All Rights Reserved.